（2/11）the increasing population became a serious social issue because, acting in accordance with their beliefs, the Hidden Christians did not limit their population, despite the prevailing limits on local food production. （3/11）The Goto clan, which had a small population and needed extra people to cultivate their lands, made an agreement with the Omura clan and started encouraging peasants in the Sotome area to migrate to the Goto domain. （4/11）As a result, many Hidden Christian peasants in Sotome migrated to the Goto Islands and other remote islands. （5/11）These Hidden Christians kept moving from place to place in these islands, forming new Hidden Christian villages wherever they went. （6/11）Hidden Christians from Sotome decided where to settle, considering how they could live alongside pre-existing communities and the existing religions in each of these destinations. 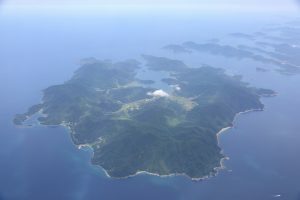 （7/11）They migrated to one island where the local clan needed extra people to cultivate previously abandoned pasturelands (Villages on Kuroshima Island: component 7). 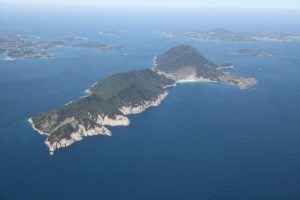 （8/11）They migrated another island that was regarded as a sacred place by Shinto practitioners (Remains of Villages on Nozaki Island: component 8). （9/11）They also migrated to an island that was used for sick people (Villages on Kashiragashima Island: component 9). （10/11）They migrated to undeveloped land of an island where needed to be cultivated in accordance with the policies of the local clan (Villages on Hisaka Island: component 10). （11/11）Hidden Christian migrants lived in a cooperative relationship with the pre-existing communities and their religions, while secretly maintaining their faith and their own distinctive religious system. As Hidden Christians managed to secretly continue their religious faith in the midst of conventional communities and the religions, they enjoyed a relatively stable life throughout the 18th century. However, towards the end of that century, the increasing population of the Sotome area in the Omura domain on the west coast of the Nishisonogi Peninsula, where the steep slopes made agriculture difficult, became a serious social issue because, acting in accordance with their beliefs, the Hidden Christians did not limit their population, despite the prevailing limits on local food production. In 1797, the Goto clan, which had a small population and needed extra people to cultivate their lands, made an agreement with the Omura clan located across the sea to the east of Goto, and started encouraging peasants in the Sotome area to migrate to the Goto domain. 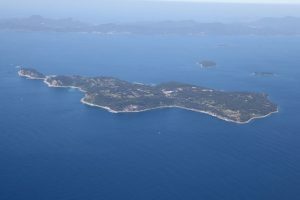 As a result, a large number of peasants in Sotome migrated to the Goto Islands, and many of these migrants were Hidden Christians. They kept moving from place to place in the Goto Islands, forming new Hidden Christian villages wherever they went. Hidden Christians from Sotome decided where to settle in order to maintain their religious communities, considering how they could live alongside pre-existing communities and the existing religions in each of these destinations. They migrated to one island where the local clan needed extra people to cultivate previously abandoned pasturelands (Kuroshima Island), to another island that was regarded as a sacred place by Shinto practitioners (Nozaki Island), to an island that had been used for sick people (Kashiragashima Island), and to an island where undeveloped land needed to be cultivated in accordance with the policies of the local clan (Hisaka Island). Hidden Christians who migrated to these islands lived in a cooperative relationship with the pre-existing communities and their religions, while secretly maintaining their faith and their own distinctive religious system. 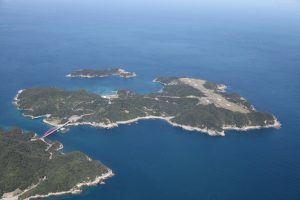 Hidden Christians maintained their religious communities after they settled in former clan pasturelands on Kuroshima Island in need of redevelopment. Hidden Christians maintained their religious communities after they migrated to Nozaki Island, which was regarded as sacred by Shinto believers. Hidden Christians maintained their religious communities after they migrated to Kashiragashima Island, which once had been used for sick people. Hidden Christians maintained their religious communities in these villages after migrating to undeveloped land on the island in accordance with a migration policy established by feudal lords.